In Last two decades from 1990 to 2010 Over 1 Lakh Kashmiris Lost their lives. 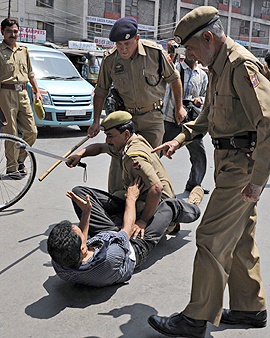 Indian Army State Terrorism also continued in 2010 against Innocent people of Kashmir. In 2010 647 Kashmiri Civilians lost their Lives including 77 Kids and 21 Women In State terrorism of Indian Security Forces. Last year 6076 Kashmiris where seriously injured in Crack Down, Firing, Shelling and torture on Protests by Indian Forces. In Middle of 2010 World also seen a massive freedom movement in Kashmir in which millions of Kashmiri mostly Youth taken part. Watching these protests even many Indian analysts said that Kashmir has came close to Freedom.